Illustrates welfare reform's negative financial impact on low-income families who often do not receive the income supports for whichWhile many valuable statewide studies document the impacts of Illinois' welfare policies, they were never meant to tell the individual stories behind the aggregated data. And so poverty remains faceless, and the distinct circumstances of living in poverty remain invisible. In order to shed light on the particular situations facing current and former welfare recipients, the Chicago Jobs Council (CJC) engaged our Welfare-to-Work Working Group members to conduct surveys of, and convene focus groups with, clients of their employment service programs. 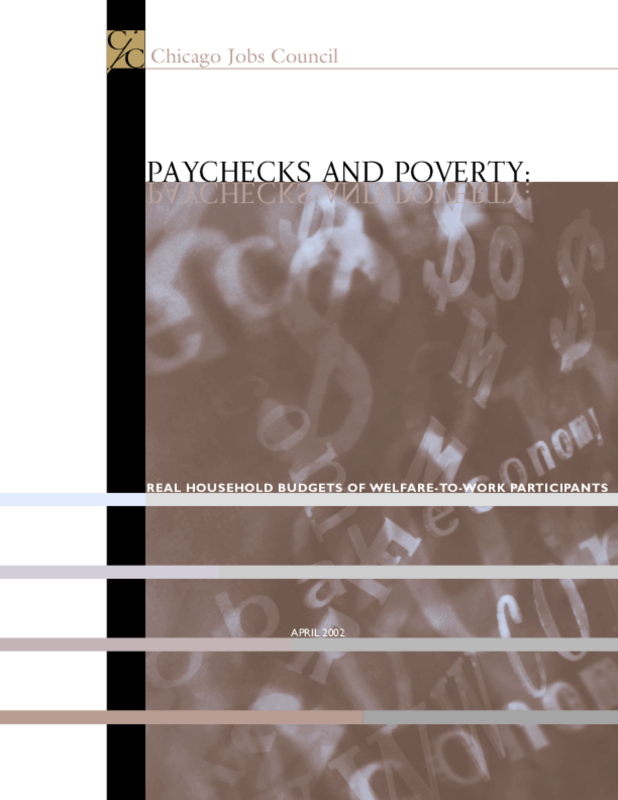 This report features case studies of four survey respondents' household budgets, and the voices of six focus group participants, to tangibly illustrate Chicagoans' financial and personal struggles under welfare reform. The important and informative life stories shared here provide valuable insight for policymakers, service providers, advocates and the public on strategies still needed to assume an end to poverty.